Have you ever seen these before? I know they tried their best. But, if my experience here at Chicago's O'Hare Airport this summer is anything to go by, they, uh, failed. Is it just me, or is a weird, torn, and half-covered plastic toilet seat way worse than a regular one? Are these the ones that are also incredibly short and uncomfortable, feeling somewhat similar to you attempting to use a child's first tiny little potty? I read the FAQ. The device contains RAZOR BLADES. Are these past the airport security checkpoint? Yes, I do believe our aviation system is so fragile, Sani-Seat could take down a plane. These folks at O'Hare LOVED it! I actually seek those out! I'm not a clean freak...and don't use those self-applied disposable "gaskets" that come bathrooms have....but I do appreciate this product. Sitting on plastic is reassuring...but I do believe the resulting "ring" is shorter than normal. I haven't encountered one that didn't work, though. And the Braille on the sign says "Wave your hand in front of a sensor you can't see, pray to God that there isn't a discharge, then sit and enjoy!" Oh god, these are horrifying. I hate them with the passion of a thousand suns. They're that bad - you feel like you're going to fall into the filthy, filthy airport toilet. Easily the worst design for a "self-cleaning" public toilet ever. Goodness. I absolutely love the music and the erratic hand motions, Cabel. Thanks for the uncontrollable laughter! I just saw these seats when I flew to ORD a few weeks ago. This is why I use the President's Club/Northwest World Club at O'Hare. These things are pretty common at "upscale" establishments in China. Given the lack of attention lavished on NON-mechanical Western-style toilets in China, I would usually seek out a Chinese squat toilet in preference to these things. They also formed an unpleasant association in my mind with other Chinese substitutions of disposable plastic for actual hygiene, such as downscale noodle vendors who, instead of washing noodle bowls, would instead line them with disposable plastic. 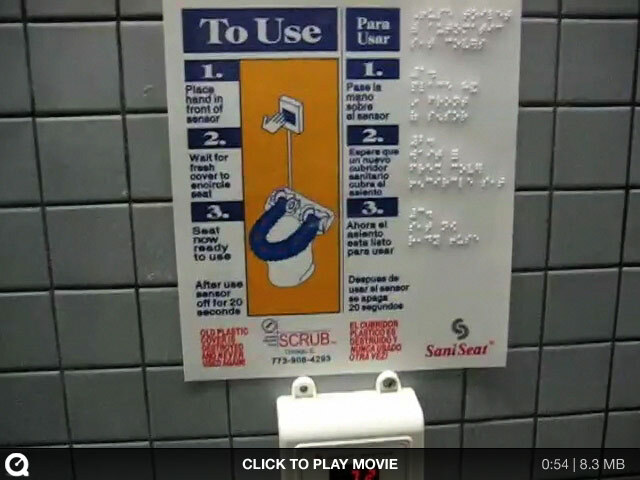 I hate to think of the blind person having to feel up the bathroom wall to read about the operation of this thing. Oh my god, that's terrible. I'd rather go in the woods... :-) but I think you HAVE to use that stuff since you are trapped into the airport gate area. LOL, you have to check out this Swedish commercial on the self cleaning toilet. I suspect we will not see it in the US.